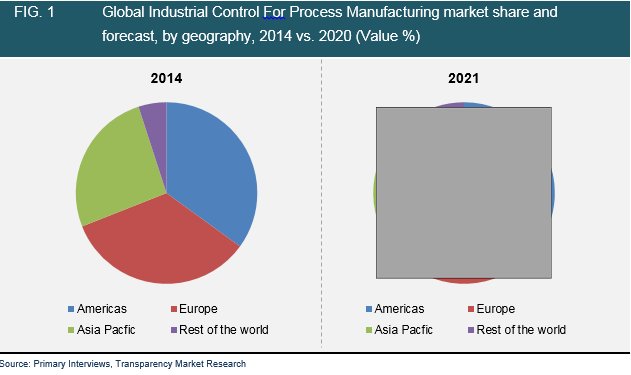 According to a recent market research report examining the global industrial control for process manufacturing market, the market will expand at a moderate, but positive CAGR of 5.2% between 2015 and 2021. As a result, the market with a valuation of US$61.23 bn in 2014 will rise to US$96.20 billion by 2021. The report, published by the market intelligence firm Transparency Market Research, is titled “Industrial Control For Process Manufacturing - Global Industry Analysis, Size, Share, Growth, Trends and Forecast 2015 - 2021”. The report states that the market is primarily driven by the rising need for uniformity in products in process industries. Control systems such as Supervisory Control and Data Acquisition (SCADA), Manufacturing Execution Systems (MES), Programmable Logic Controller (PLC), and Distributed Control Systems (DCS) find applications in numerous industries for controlling, measuring, and monitoring a variety of industrial production activities. As these systems allow the efficient usage of resources and reduced wastage of raw materials, their demand across the globe is increasing at a fast pace. The rising demand for reducing production time and the heightened concern regarding safety and security of machineries installed in industries are the other key factors driving demand for a variety of industrial controls for process manufacturing. The report states that the growing demand for automation in process industries such as power, food and beverages, and oil and gas will aid market growth over report’s forecast period.However, stagnant growth of many production industries over the past few years in developed economies such as Europe and North America is inhibiting the overall development of the market. Nonetheless, the flourishing industrial sectors in developing economies are boosting growth of the market and leading to an increased demand for a variety of control systems for process manufacturing industries in regions such as India, China, and Brazil. The report segments the market on the basis of three criteria: technology, application, and geography.On the basis of technology, the market is segmented into SCADA, PLC, DCS, and MES. Of these, the market segment of distributed control systems held the largest share of the market and was valued US$22.26 bn in 2014. This market segment is expected to maintain a stable growth pace over the report’s forecast period. Of the key application segments of the industrial control for process manufacturing market studied in the report, the market segment of oil and gas held the largest share in the market in 2014 and is expected to maintain its dominant position over the report’s forecast period as well.Geographically, the Americas held the largest share of the market and is expected to continue its dominance over the report’s forecast period. Europe, following Americas closely in 2014, held a 34% share in the market. The report also presents a detailed analysis of the competitive landscape of the global industrial control for process manufacturing market with the help of business profiles and finance-related details of some of the key vendors operating in the market. The overall competitive scenario of the market is also examined by studying the recent developments in the market, activities such as mergers and acquisitions, and the prime strengths and weaknesses of market’s key players. Some of the key vendors of the market profiled in the report are Emersion Electric Co., Mitsubishi Electric Corporation, Honeywell International Inc., ABB Ltd., Siemens AG, Schneider Electric S.E, and Rockwell Automation.